The Taoiseach has said the news that US President Donald Trump is to visit Ireland "came a little bit out of the blue". Leo Varadkar said there is a standing invitation for any US President to come to Ireland and many have in the past. But speaking on the Marty Squad on RTÉ Radio 1 this evening, the Taoiseach said the Government had not known until "just a couple of days ago" that President Trump would be taking advantage of his trip to Paris for the Armistice anniversary to visit Dublin and Doonbeg in Co Clare. He said a programme for the visit had not yet been worked out but any schedule would have to respect the fact that we will be inaugurating a President on 11 November. The Taoiseach added that there will have to be time and space for the Irish state to mark the Armistice which ended a war in which so many Irish people fought. The news of the visit of President Trump in November was met by calls for protests to be held by opposition parties and campaign groups. 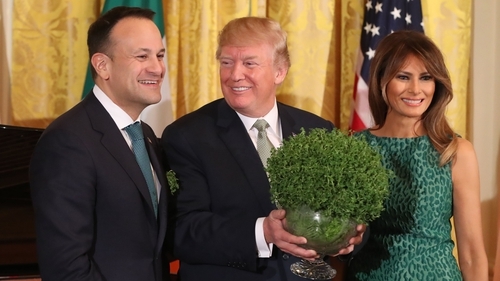 Taoiseach Leo Varadkar said that he understood that many people here disagree with or dislike President Trump and he himself disagreed with many of his policies. But he said the relationship between Ireland and the US is strong and important; much more important than any Irish Government or US administration and the office of US President must be respected.